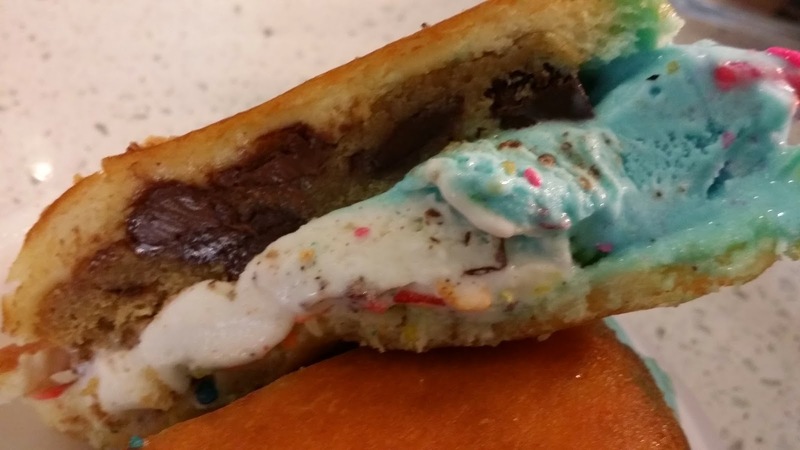 DONUT STUFFED ICE CREAM & FRESH COOKIE TOO?! 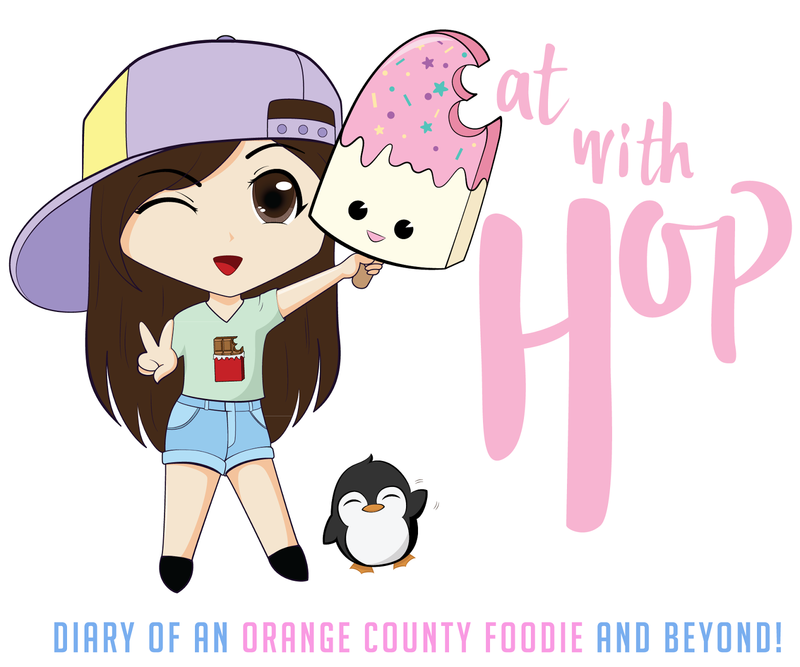 @ THE FROZEN BAR - GARDEN GROVE - EAT WITH HOP! 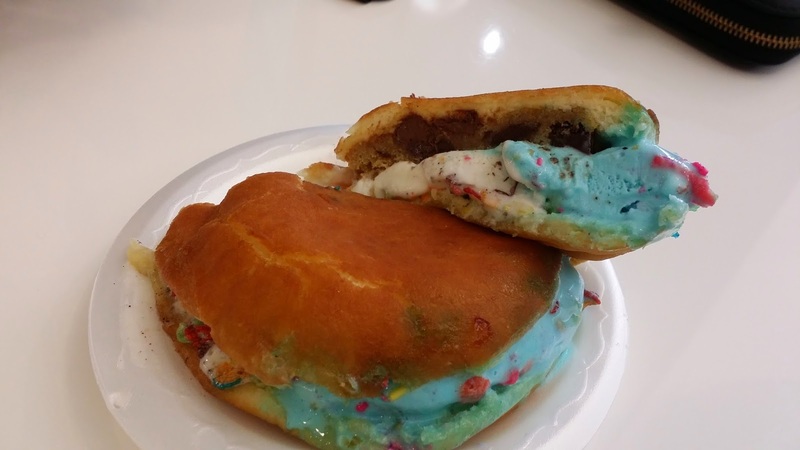 THIS IS THE FRONUT (FROZEN DONUT) STUFFED WITH A FRESHLY BAKED CHOCOLATE CHIP COOKIE AND SMURFDAY CAKE AND OREO FLAVORED GELATO WITH FRUITY PEBBLES TOPPING. IT WAS JUST AN EXTRA 50CENTS FOR THE COOKIE! 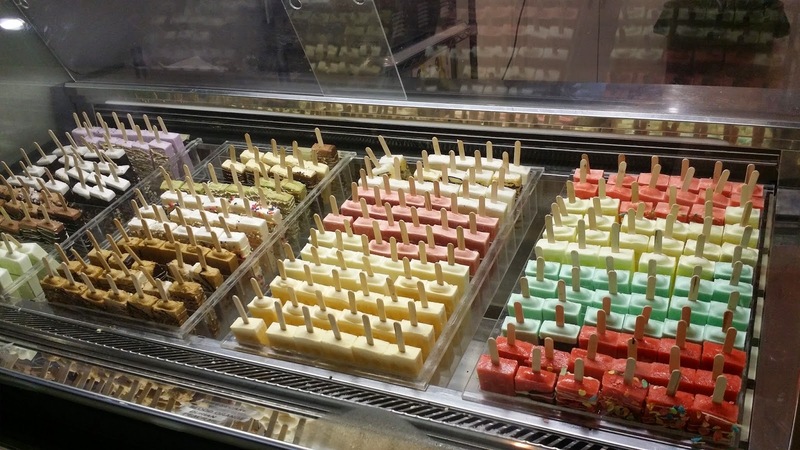 I HAVE NEVER SEEN THEIR POPSICLES FULLY STOCKED LIKE THIS... AND IT'S BEAUTIFUL! FINALLY THEY HAVE THEIR TOPPINGS OUT FOR DISPLAY! 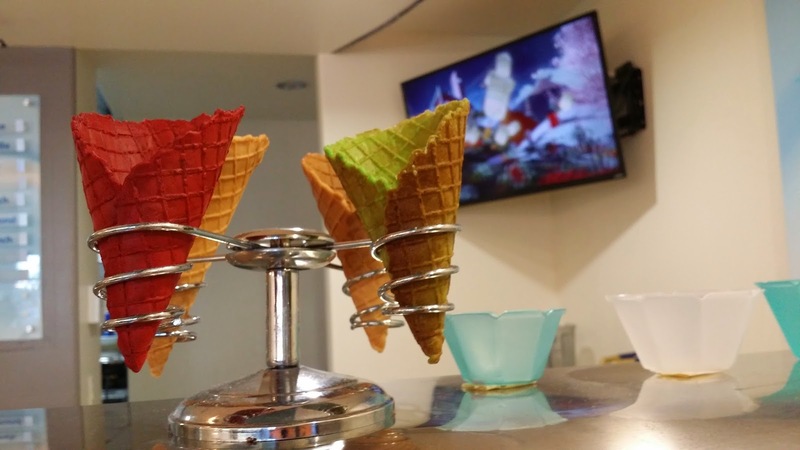 PANDAN LEAF WAFFLE CONES, RED VELVET WAFFLE CONES, AND THE ORIGINAL WAFFLE CONES ARE ALL OFFERED HERE. SO MUCH GOODNESS! I ABSOLUTELY LOVE THEIR ICE CREAM! IT WAS A SUPER SUPER HOT DAY. THEREFORE, ICE CREAM IS THE ANSWER! I KNOW IT WAS OUR FAULT THAT WE TOOK SO MANY PHOTOS THAT IT MELTED SO FAST...BUT THE WORKER ALSO SAID THAT THERE WAS SOMETHING WRONG WITH THE FRIDGE BECAUSE IT WAS TOO HOT THAT DAY! I called up Christina immediately after I saw Frozen Bar's instagram photo of a heart-attack creation: The Fronut + Freshly Baked Cookie. Social Media really works at advertising don't you think ? Or maybe I'm just a sucka for food photos. Either way, Christina and I made a trip to Frozen Bar that evening looking forward to get high on sugar! We came in the store and luckily it wasn't crowded yet. It took awhile for us to make up our minds but we eventually decided to get the Smurfday Cake (birthday cake flavor) + Oreos + Fruity Pebble cereal toppings + Freshly Baked Chocolate Chip Cookie. Wow! Isn't that such a mouthful to say already? We were afraid that the fronut itself wouldn't be able to close because we got so many things to stuff it! 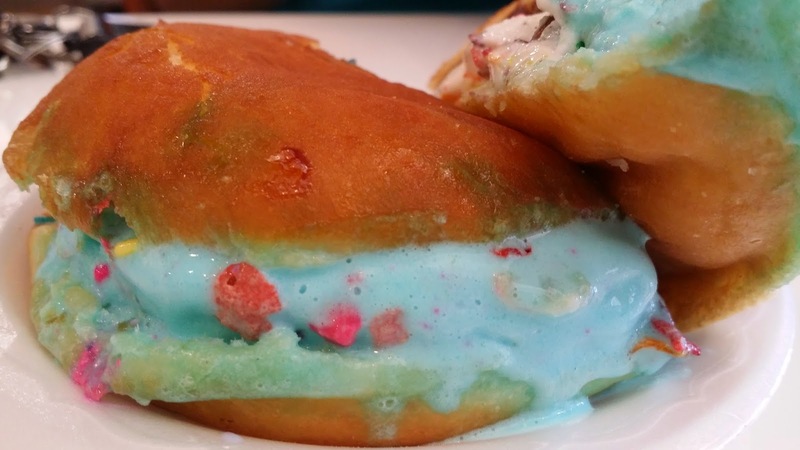 And indeed, it did look a bit like an over-saturated stuffed donut especially since it really didn't close all the way. And, in addition to the extremely scorching heat diffusing through the store from the outside combined with the freshly baked + HOT cookie, the ice cream didn't stay like "ice" for very long. 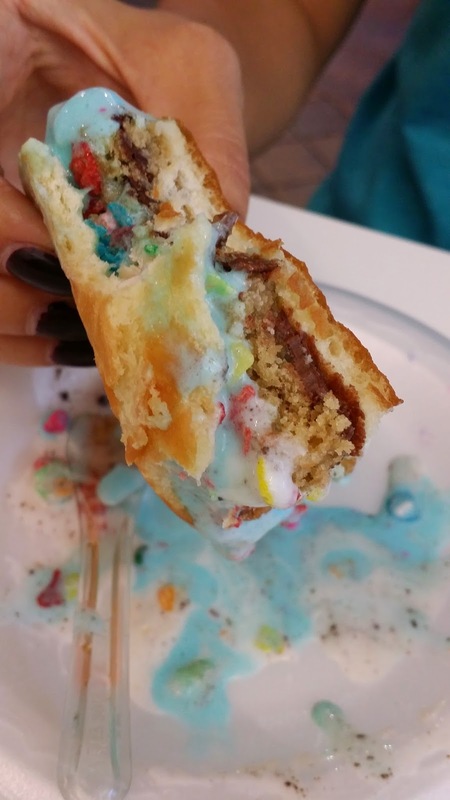 In fact, it was quite messy to eat and it was melting and dripping everywhere. 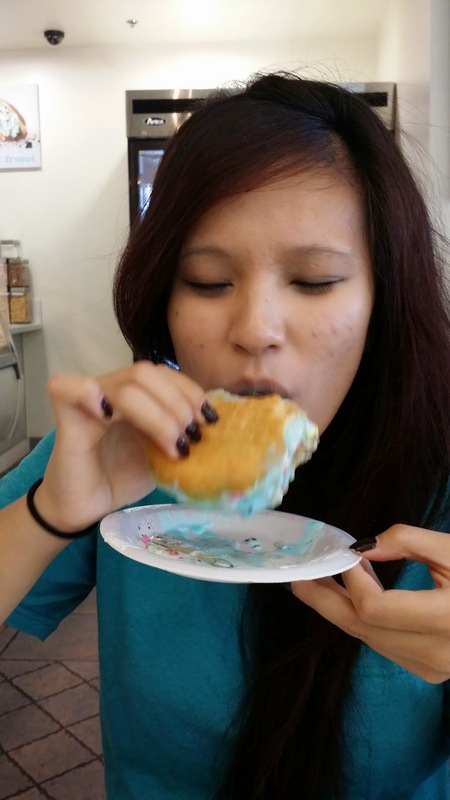 But overall, our stomachs were pretty satisfied and we definitely got that sugar rush we unfortunately asked for. 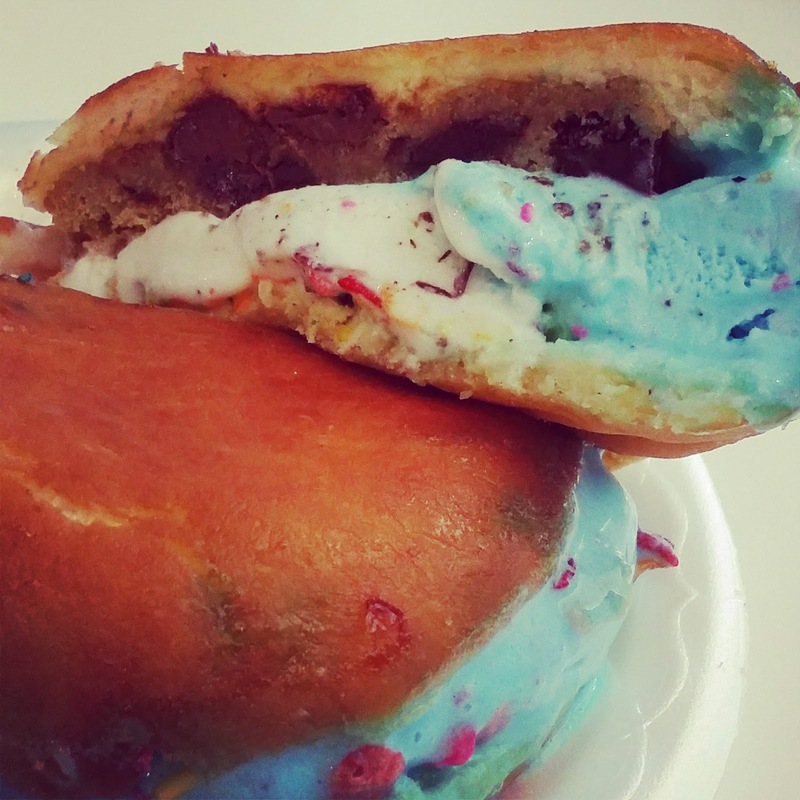 Many people ask me this question: Is it better than Afters Ice Cream? I personally think that they are very different. 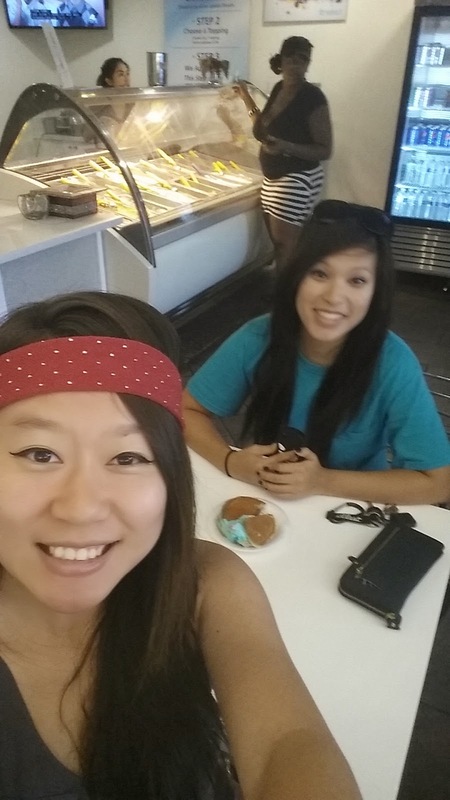 Afters sells ice cream while Frozen Bar sells gelato. This may be a very minute difference in detail that it might not even matter. But, the huuuuge difference is in the flavors. Both places have very very different flavors. If I ever craved Jasmine Thai Tea or Cookie Butter or Cookie Monster ice cream then I would probably head over to Afters. However, Frozen Bar has it's own very uinique flavors as well like Smurfday Cake (current favorite) and Thai Tea (very strong! ), Peanut Butter Pretzel (another fave), Banana Cocoa Crunch (another serious fave) and more. If I really had to choose between the two, then I would choose the Frozen Bar over Afters because although it is not per se the "original" in the donut stuffed ice cream concept (milky bun vs fronut), Afters is still way too overhyped for me to bear waiting in line just for ice cream when I could just quickly satisfy those cravings here at Frozen Bar. 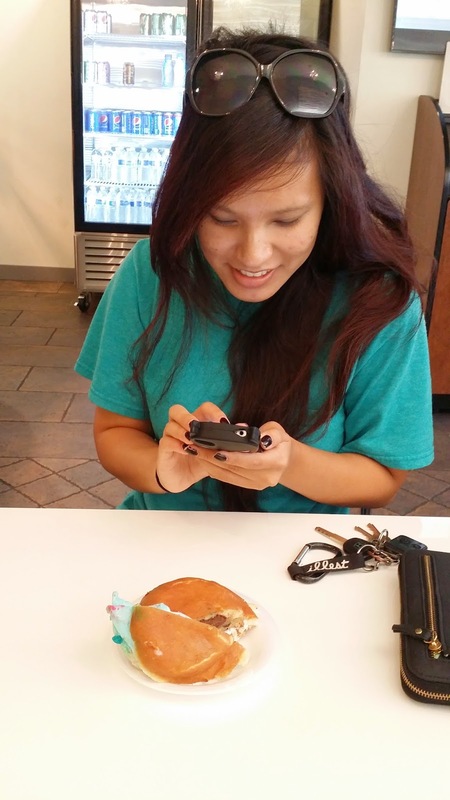 As for the milky bun vs. fronut...I think the fronut is a bit poofier than the milky bun. But the difference is so minimal that I can't really tell. They are pretty much the same to me. 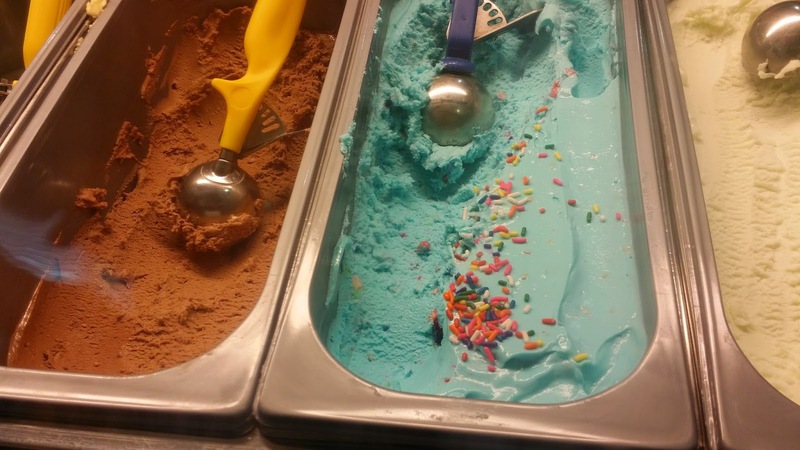 However, the flavors of ice cream is the huuge difference here and it just depends on what flavor you're craving for. 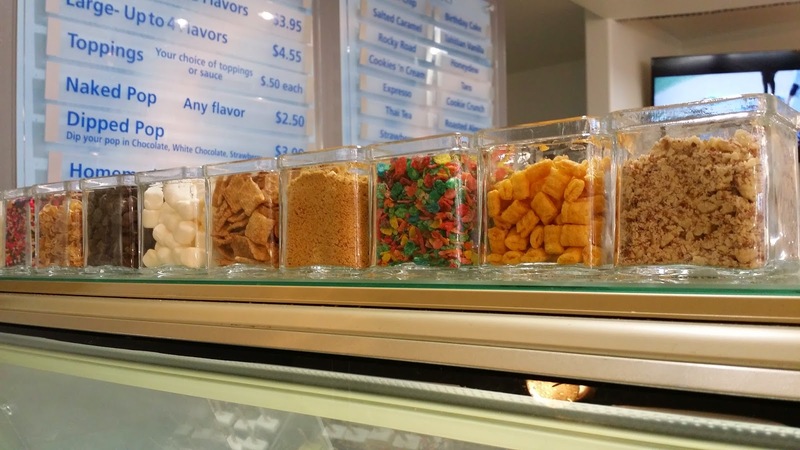 Another reason why I would choose the Frozen Bar is because they have more than just gelato and fronuts to offer. They've got popsicles (super cute!) and frozen hot chocolate drinks and macaron ice cream sandwiches. Even their froffle (freshly made waffle with ice cream inside) looks pretty damn delicious! But if y'all are down just for the original, Afters Ice Cream is worth a try (when it's off-hours and not busy and not a 1 hour + wait). 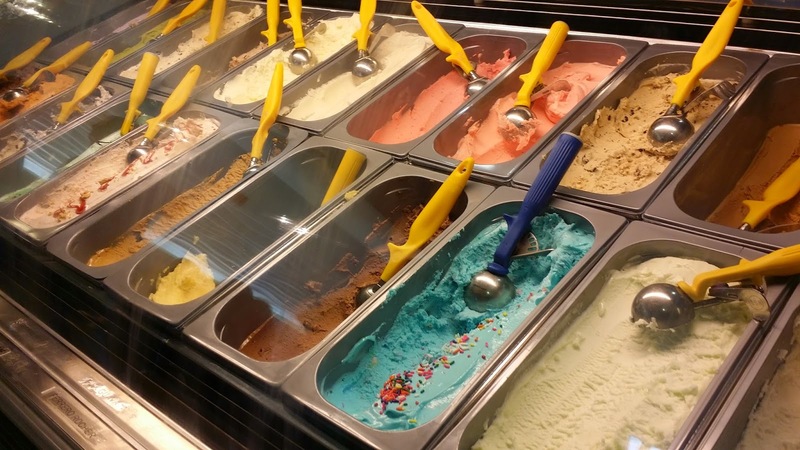 up to 2 flavors of gelato! anything extra is only 50 cents! you can even add a macaron shell instead of a cookie! our cookie was just 50 cents extra! I love how they cut up the fronut so it's very share-able! you get through the line quick! YES, I would go here again as I have been because they have amazing and unique flavors + awesome customer service. I don't know if it's just me or not but every time I've been here the workers have all been super friendly and nice!